Heat oven to 425°F. Line a large baking sheet with parchment. 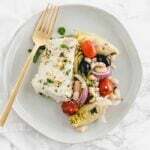 Place Alaska whitefish in a large, shallow dish. In a bowl, whisk together marinade ingredients. Pour half of the marinade over the fish. Cut onion into 1/2-inch pieces. Drain artichoke quarters, beans and olives. In a large bowl, combine onion, tomatoes, artichokes, beans and olives. Pour remaining marinade into the bowl and gently toss to coat. Place the fish on the baking sheet. Spread vegetable mixture evenly around the fish in a single layer. Bake 10-15 minutes, depending on the thickness of the fish. Place under the broiler for about 2 minutes, or until the tomatoes start to pop.